Amnesty colleague Elke Kuijper became the Dutch contact for the organisation The Best Friend (TBF) at the beginning of this year. TBF was founded ten years ago by Burmese monks in order to fight poverty and to peacefully strive for (political) change in Burma. This month, it has been two years since the monk uprisings (Saffron Revolution) took place in Burma. Because of this, and also to launch the Dutch branch of TBF, TBF-member Ashin Kovida will visit The Netherlands this week. Elke Kuijper writes about this. Once upon a time…there was a little boy from Burma. He grew up as an only child in a simple village. Without water and electricity. When he was fourteen years old, his father asked him to go to the monastery and become a monk. For a poor boy like him, this was the only opportunity to enjoy an education. He later moved to a monastery in Mandalay. It was there, that he met a monk with the nickname of King Zero. King Zero was intelligent and knew a lot about the (political) situation in Burma. Burma has been suffering under a strict military regime for almost fifty years. There is no freedom of speech. There is no press freedom. There is forced labour. And child labour. The education is of bad quality. There are more than 2000 political prisoners. The very superstitious generals try to keep the country under control in a brutal manner. In 1990 they allowed free elections, that were won by the opposition party NLD by a big majority. Their leader, Daw Aung San Suu Kyi, was arrested shorty afterwards. She has spent more than thirteen of the past twenty years under house arrest. The boy was shocked by all these stories King Zero told him and decided he could not passively watch and do nothing. He joined the group The Best Friend, which King Zero had founded at university with Ashin Sopaka, another monk. The boy started to teach English. In the evenings, at secret locations, for it was not allowed by the regime. During his classes, people also talked about politics and human rights. The regime found out about this and the boy was no longer safe. With the help of a befriended Swiss couple, he fled Burma. He has been living in a Swiss village since 2006 and is pretty much the only Burmese monk in the country. He continues his struggle for the freedom of his country and his people. This week Ashin Kovida, for that is the boy’s name, will visit our country. On Friday 11 September, he will be interviewed in De Balie by tv presenter Baghram Sadeghi. This week is his story. And the story of so many other people from Burma. During their studies at a university for monks, King Zero and Ashin Sopaka did not like the oppresive climate at their university: teachers were strict, discussions were not allowed and as soon as one got politically engaged, one was sent away from university. They founded The Best Friend. Because they wanted to talk about politics. And about human rights. Ten years later, TBF informs many people from many countries about Burma. And TBF raises funds. TBF founded more than fifteen libraries and organises education for Burmese refugees in Thailand. TBF also supports families who live on the rubbish dump of Mae Sot, in Northern Thailand. Their motto: education opens people’s eyes and ears and is THE way to eradicate poverty. King Zero and Ashin Sopaka had to flee Burma as well. Mainly because of their involvement in the organisation of the monk uprisings. King Zero played a major role in this. Just like his friend, Ashin Gambira, whom Amnesty campaigns for and who is serving a 63 year prison sentence at the moment. This month, it is the second anniversary of the uprisings and the media are talking about a possible second revolution. The regime is frightened and keeps monateries and monks under tight control. Some people were arrested last week. On 25 August, monk leaders put an ultimatum to the regime: they demand an apology for the crimes committed against the monks before 2 October. If not, then a pattanikkujjana (alms boycott) will start on 3 October. Burmese monks go out in the streets every morning on their daily alms rounds. They receive food donations, which works two ways: a monk is not allowed to work for money and receives his daily food and for the people who give alms, it is good for their karma to donate to a monk. It is the alms from government people that the monks will refuse to accept. Which is horrible for a Burmese person. Even for the regime, which – by building enormous temples and donating a lot of money and food – is trying to convince the population of the fact that she is a good Buddhist. One that arrests and tortures monks too…? ?In the meantime, Ashin Kovida is ready to leave for Amsterdam. He’s looking forward to telling his story! Ashin Kovida phoned last night. He is looking forward to seeing the people in Amsterdam and wonders what the differences will be with Switzerland. When asked whether he had already packed his suitcase, he replied: “I don’t have a lot of luggage, just one more robe”. I’m looking forward to it, too. After all, it’s not everyday that a monk will be visiting… Besides, it will be nice to see him again. Because I have met him before. In 2002 in Burma. After long discussions with my travelling partner, we decided to go to Burma. I had major doubts about going at first; hadn’t Aung San Suu Kyi asked tourists to stay away? But I never regretted going. And now, many years later, it feels like we were able to give those few people whom we really spoke to back then, a voice. And we were able to pass on their stories. Their isolation may have been broken somewhat because we took their stories, into the free world. 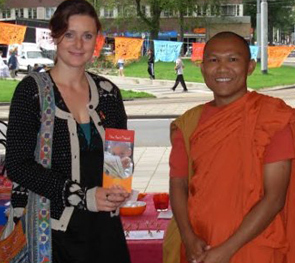 As a traveller you easily get into contact with monks in countries like Burma. They want to practise their English with you and initiate contact. Two Burmese monks wanted us to meet their English teacher. So, one evening, we landed at a teahouse to have dinner. We were surrounded by three monks, all drinking tea, for they were not allowed to eat anymore at this time of the day. The English teacher was Kovida, who impressed us instantly. His humour, his eloquence and his future dreams. We exchanged addresses and back home, naively sent parcels with books and cards. Later, when I worked for Amnesty International, I encountered the case of Ashin Gambira. This monk was arrested after the uprisings of 2007. I thought back of the monks I’d met in Burma. I could remember one name. I typed in “ Ashin Kovida” on Google and after a while, found a video of a slightly bigger monk, who had fled to Switzerland. It was Kovida. And now, seven years later, I try and do my little bit to support his struggle for freedom in his country. I’ve been cleaning like mad the whole morning in order to get Ashin Kovida’s room ready. In the afternoon we go to the airport to pick him up. A bit nervous after all. How would it all go? Would we get along? From the moment he walks towards us, we have a good time. We talk about all kinds of things and our one and a half year old son even gives him a kiss-goodnight when he goes to bed. He likes kids. We walk around the neighbourhood and the Sarphatipark, where a drunk man calls him while making kung-fu like movements. A Hare Krishna monk approaches him and seems very happy to meet a real monk. Our son keeps on running towards the water, trying to catch ducks. It’s a wild afternoon!??? We talk things through for the interviews tomorrow and for the evening in De Balie and hope to have a big audience. The more people hear about Burma, the better. Saturday morning the Buddhist Broadcasting Corporation will visit for a radio interview. Media attention is quite good. Let’s cross our fingers! PongPong (as is the way to address a Burmese monk, it turns out) is telling jokes on our couch. About how Burmese people always go abroad to visit the dentist. Because they cannot open their mouths in their own country.. I wonder why I was so worried about receiving a monk in my house. I almost forgot about one important rule for a monk: flexibility. Manetphyan tweme (see you tomorrow)! Ashin Kovida is busy in The Netherlands. Friday morning on our way to Amnesty, I have a chance to take a little tourist route. We walk across the Rembrandtplein, which is just waking up, with shopkeepers starting their day and cleaners getting rid of last night’s rubbish on the streets. He loves the flower market (especially the carnivorous = meat eating plants make a big impression) and enjoys the Begijnhof. We visit the chapel/church on the Kalverstraat. He videotapes the Dam square and the royal Palace and enjoys the architecture. At Amnesty’s offices, he has two interviews. Later in the afternoon, there is another one at home. The evening with U Kovida in De Balie goes well. There are fewer people than I had hoped, but the audience is well informed and interested in his story. Ashin Kovida talks about his country, the uprisings, sanctions, what we can do to support them and what it is like to live under an oppresive regime. Presentor Bahram Sadeghi nods understandingly. There are clearly links with his own country (= Iran). Ashin Kovida is satisfied and enjoys talking to the people. He even meets some old friends who came from far to see him again. I am not the only one he impressed and these friends are active and willing and able to support TBF. It is inspiring to meet people who want to support the peaceful struggle for democracy in Burma! And despite the quite small Burma-world in The Netherlands, our network is expanding. Kovida is happy and tells us he feels at home here. I am happy too, because he feels at ease here and is able to tell his story. Saturday morning he is interviewed by a reporter from the Buddhist Broadcasting Corporation. At nine o’clock in the morning I finished cooking rice and curries so that he can eat on time. That day, we are at the Worldfestival (Wereldfestival) in Amsterdam, where Kovida is a special guest. In the evening he speaks about Buddhism in Spiritual Centre Karunika. Sunday he meets our families before we say goodbye at the airport. We made a good start with The Best Friend in The Netherlands. And a monk like Ashin Kovida as a guest is definitely to be recommended!